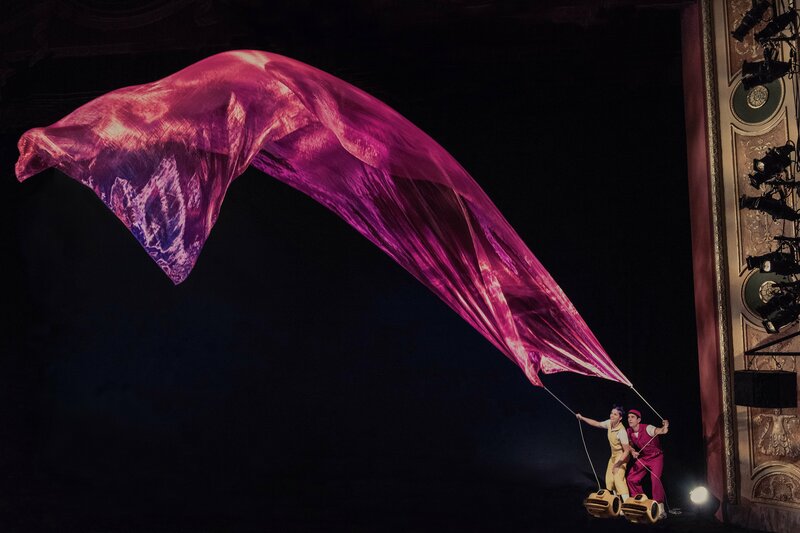 A highlight of Arts Festival Dunedin 2018 will be a dazzling circus-style adventure that brings to life the air we breathe. Bruce Munro talks to Air Play creators and performers, husband and wife team, Seth Bloom and Christina Gelsone. There's a strong chance we're going to like Seth Bloom and Christina Gelsone. They sound nothing like Donald Trump. They would have had a good basis for comparison; they've toured Air Play, their circus art show, in more countries than most of us can shake a stick at. So, the question wouldn't have been just an expression of national neurosis, but a genuinely interesting line of inquiry. You agree, don't you? Good. You'll have to ask them yourself, if you get a chance. Instead, the first question catches them a little off guard. What sort of people come up with an idea like Air Play? Who dreams up using fans to set free metres of gorgeous, translucent, crimson silk to arc and dance high in the air? Who decides to climb inside enormous, bright red and yellow balloons to turn themselves into quivering, rubbery, autonomous puppets? Who dares to believe audiences around the world will be astounded and delighted by a whimsical, clown-meets-art ode to childhood friendship? "We've never been asked a question like that before,'' Bloom, who is speaking by phone from a Hong Kong hotel, replies. "We're a husband and wife clown team,'' he answers hopefully and then moves quickly to more solid ground. But, what sort of people are you that allowed you to come up with so distinctive a show? "Our friends in New York would say we were crazy,'' Gelsone replies with a laugh, sounding as though she is standing just to one side of Bloom, perhaps both of them bent towards a cellphone lying on their hotel room bed, temporarily oblivious to the view of silver skyscrapers and dragon teeth mountains filling their window. Then Gelsone too manoeuvres to more familiar territory. The germ of Air Play came after seeing Daniel Wurtzel's amazing kinetic sculptures and wondering how it would go if they added some humour, she says. The question comes a third time. What sort of people are you? Closer. Great. Let's keep the ball rolling. Bloom had a background as a juggler. Gelsone's was in ballet and mime. They met in Afghanistan, in 2003, during the first of what became seven annual trips there with NGOs. Afghanistan seems a strange place for any clown to volunteer to visit, let alone two literal ones. "An Afghani man I was working with told me this,`Laughter is sometimes more important than food','' Bloom explains. They have spent a decade living out of a suitcase, doing exactly that. They were in New Zealand, in 2010, in Christchurch, for the World Buskers Festival. "When we are together, we are at home,'' Gelsone says. "Seeing all these different cultures is our ideal life,'' Bloom adds. Things have changed since the advent of Air Play. The one suitcase has become many. And clowning has been raised to new heights. "Daniel's sculptures are exhibited in museum's around the world,'' Bloom says. It took five years. Three hours of material were amassed and then whittled down to 60 minutes of magic. The air sculptures are built in collaboration with Wurtzel. The director is Cirque de Soleil Paramour writer West Hyler. Even so, they have been surprised by its success. They now have three Air Play stage sets constantly travelling the globe ahead of them to their next destination. Experience has taught them the show can work anywhere. It won't be the last time those two words are used. Air Play has no strict narrative. The decision was made early on to avoid a love story. How love is expressed and relationships are conducted varies too much between cultures for a show with global aspirations. It is more a poem than a story. "So anyone can come to it and find a way to identify with it,'' Bloom explains. A poetic ode to childhood is how it has been described. "Childhood is universal,'' Gelsone says. Everyone has been a child, and as a child has had either a sibling or a friend. Air Play makes a lot of use of fans. Working with air to create magic is not easy, they say. Each theatre has different air currents. So a lot of time before the first show in each new venue is spent adjusting the more-than-a-dozen ventilators. The weather also plays a role. Rain means low air pressure, requiring more air movement to get the same effect. A hot day, and it has to be reversed. Even the effect of the audience has to be taken into account. "You think you've set it up right, but you have to guess the effect all those people - each a radiator generating body heat - will have. "How many people? In what size space? Will it be a hot house or a cold house? The payback is a little different for each of them. It is insightful. "All we want to do is make people laugh,'' Gelsone says. "It's touching when someone says afterwards that they've been impacted by the beauty,'' Bloom adds. The conversation is beginning to taper off. They have flown into Hong Kong that morning, from Brisbane. They will have a couple of days off; to see the sights and sample the food. Then a day is spent preparing in the theatre, ahead of four days of performances. From Hong Kong they return home to New York, then to Germany and Canada, before flying to New Zealand. They are coming here 10 days before performances begin. "To have a good look around your beautiful country,'' Bloom says. Ah, thank you. That's what we've been waiting to hear. Gelsone, no doubt, will be here for a bit of laugh. Which we also like.